Efficiently make the highest quality cigarettes possible with the 9 unit packNpuff. It is the only commercial tool that provides total control over the amount of tobacco added to each cone. Other tools are designed to completely fill cones with tobacco, which makes it nearly impossible to place a specific amount into each cone. As a result, cigarettes made with these tools are usually unevenly packed and require significant post-processing labor to pass off as acceptable. packNpuff has exclusive, patent pending funnel technology that enables total control over how much tobacco is added to each cone. With this level of control, users can easily and consistently add the same amount of tobacco to each cone. This means users can add a small amount of tobacco, pack it down and repeat the process until the desired cone size is achieved. The provided measuring scoop, which holds 0.2g to 0.3g of ground tobacco, and wooden packing stick make the loading process incredibly simple. This leads to high quality, evenly packed cigarettes that can be as small as 0.1g or as large as 0.9g. The 9 unit packNpuff is built to last. It is proudly manufactured in Boulder, Colorado, USA and is made of high quality, environmentally safe plastic. INCLUDES: 30 day money back guarantee, packNpuff 9 unit cone filling tool, cone ejection pad, measuring spoon (0.2g - 0.3g capacity) and wooden packing stick. CREATE CUSTOM SIZED CIGARETTES: Forget all other machines, they only produce 1 size: COMPLETELY FULL. 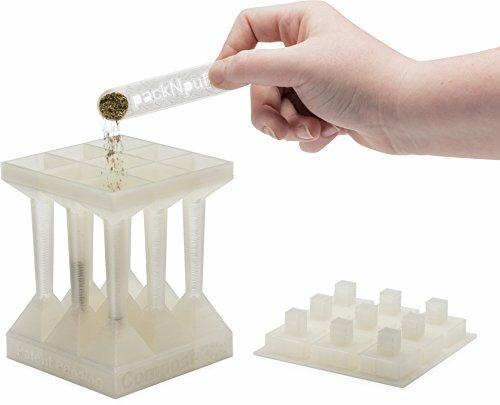 With packNpuff's patent pending funnel technology and the included measuring scooper you can easily make cigarettes in ANY size! If you have any questions about this product by packNpuff, contact us by completing and submitting the form below. If you are looking for a specif part number, please include it with your message.